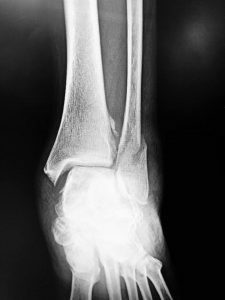 The fibula bone has a spiral fracture and the mortise has been disrupted. 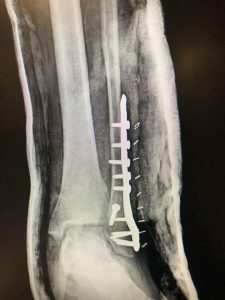 A strong stainless steel plate and 11 screws did the trick. Six weeks on crutches, followed by six weeks of PT and lots of home exercises, then this gal will be ready to hit the tennis court again.